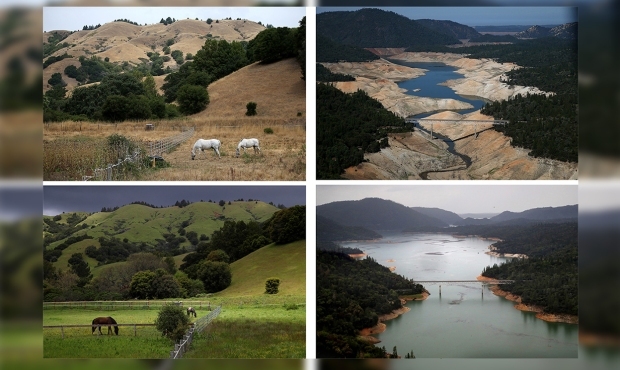 Just three months ago, more than 73 percent of California was in drought, but that number has dropped to 9 percent after this winter's powerful storms, according to the weekly Drought Monitor report released Thursday. Last week, 17 percent of the state was in some type of drought, according to the Monitor, but conditions improved after more precipitation during one of California's wettest winters in years. Two or more inches of precipitation was reported on parts of the Northern California coast, the Sierra Nevada range and in San Diego County over the last week. The report noted improved conditions in the San Joaquin Valley, the coastal range to Santa Barbara County and Southern California. "Basically, 95 percent of California was in some form of drought at this time last year," said NBC4 forecaster Crystal Egger. "It's incredible progress. We've had a fantastic season." Santa Barbara County's Lake Cachuma, which has been slow to recover from the dry spell, was a 45 percent to capacity compared to 42 percent one week ago. The area northwest of Los Angeles and extreme southeastern California are the only parts of the state still in severe drought this week, accoding to the Drought Monitor. The report comes a day after water resource managers said the Sierra Nevada snowpack is close to setting records notched more than three decades ago. 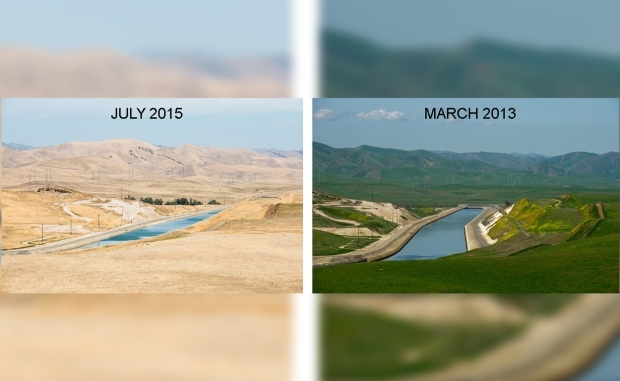 It's all welcome news after five years of punishing drought, including the driest year in California's recorded history. A series of storms that doused the state in the first two months of the year brought the water content of the snowpack up to a "pretty phenomenal" 185 percent of normal, well above the 84 percent of normal a year ago, said Frank Gehrke, the state's chief snow surveyor. 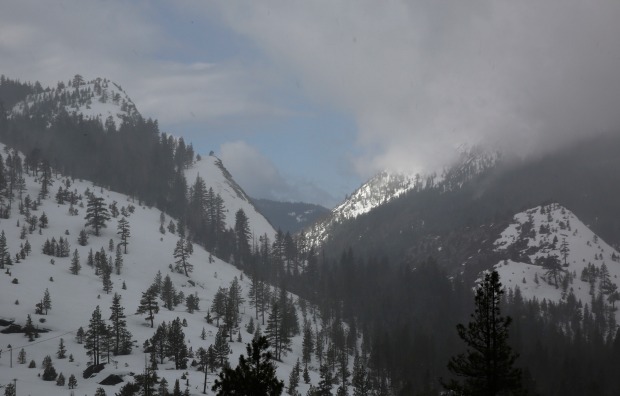 Winter snowfall on the 400-mile mountain range provides roughly one-third of the water used in the nation's most populous state as the snow melts over the spring and summer and fills reservoirs supplying farmers and city dwellers. Gehrke said the snowpack is nearing levels last seen in 1983. He noted that levels reached by April 1 are a key marker because that's the typical end to the wet season. "We've busted through April 1 values pretty much at all snow courses throughout the state," Gehrke said. At the southern end of the Sierra Nevada -- with the highest mountain peaks -- more than double the normal amount of snow has piled up. It was stark contrast to earlier snowpack measurements. In April 2015, Gov. 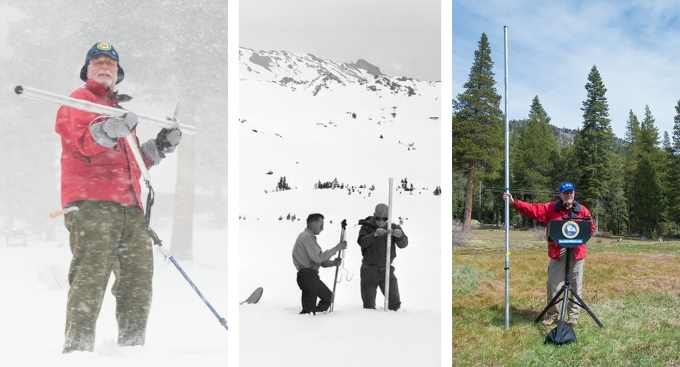 Jerry Brown attended the monthly snowpack survey near Lake Tahoe, standing in a field that was barren of any measureable snow. Brown later ordered residents to use less water at home -- a first for California. In the state that leads the nation in producing fruits, vegetables and nuts, some farmers drew down wells to grow their crops; others left fields unplanted. Now, the extreme weather pendulum is swining the other direction. Flood damage statewide reached an estimated $1 billion, officials said. In San Jose, one of the hardest hit communities, residents are returning to evacuated homes and sorting through belongings as the city comes to grips with an estimated $70 million in damage.